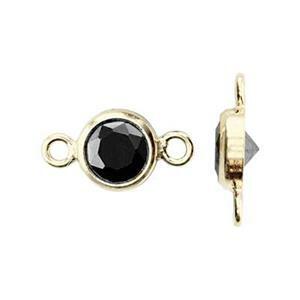 14/20 Gold Filled 8.7x4.7mm Bezel Jewelry Making Link, 4mm Black CZ, 1mm Closed IDs. Facet cut stone has a pointed culet at the back for maximum light refraction. Used these as embellishments to simple gold necklaces and they worked great. Ordered more already. Used with GJ33 jump rings and 31318F chain.